Frigmaires variable speed disperser is a highly versatile machine for the production of paints, inks, coatings, construction chemicals etc . The main function of this machine is for breaking up of the aglomerates , wetting & dispersing of pigments in liquids. Due to the variable speed control the speed of the shaft can be varied at different stages of the mixing process thus saving power. 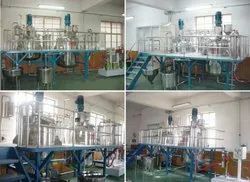 Another advantage is in the hydraulic lifting and lowering arrangement wherein the height of the mixing shaft can be adjusted so as to obtain a uniform product circulation & perfect dispersion. A wide range of paints & inks can be produced on our dissolvers without the use of grinding media. Mixing vessels of different capacities with heating, cooling & vacuum arrangements are also available. Electronic AC frequency drive to vary rpm from 0 - 3000. Looking for Paint Plant Machines ?